:: The pomp and circumstance, activity and sheer people-watching joy that you find anywhere that tourists, wealthy commuters and royalty meet. For most of our time there, we lived in a converted attic of the old guards housing, directly overlooking Windsor castle. The building itself was hundreds of years old, black beams, low and lopsided doorways and walls, huge open fireplace. Our lives were so full of history, we couldn't even put the garbage bins out in the summer because they were a security risk when the changing of the guards would march past our front door. Our lives were busy. When we weren't commuting, we were eating out, going out, drinking out and spending out our bank accounts and London salaries. A different life. Most Saturdays, one or both of us would wander down the main street to the local coffee shop for 2 hazelnut lattes. We would sit for ages, reading newspapers nibbling biscotti and bagels, smiling at our "lucky escape" as we watched couples struggle with toddlers and babies. Five years and almost 2 children later, life couldn't be more different. Lucrative jobs gave way to meaningful ones. Nights out on the town have turned into nights in with the needles. Where I used to boast about my ability to hold my weight in alcohol, I now make similar statements about tea consumption (though my pelvic floor does play a factor in my ability to hold it in). Life is simple, small and centred on someone other than ourselves. And even when life changes beyond recognition, some things still stay the same. I love the crisp almondy taste of a biscotti nibbled with a cup of (cold) coffee. And every time I make a batch, I thank my stars for my "lucky escape". Whisk the egg and sugar together until frothy and thick. Beat in the vanilla and almond essense and then fold in the flour, baking powder and salt. It should form a firm-ish dough. You may need a bit more flour at this stage, depending on the size of the egg. Fold in the slmonds and chocolate if using. Form into a loaf-like log, about 25x5cm (10x2in). Place on a piece of waxed paper/baking parchment and bake for 25 minutes until pale brown. Take out of oven and let cool for about 5 minutes to firm up. Cut diagonal slants, about 1cm (0.5 in) thick. Put these back in the oven on the waxed paper for another 10 minutes or so. 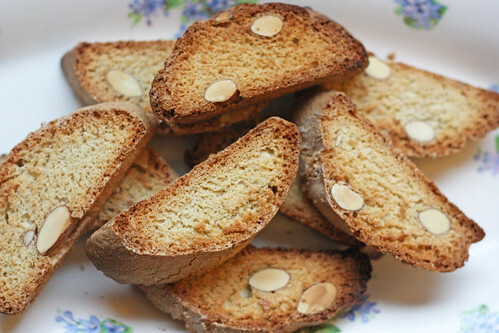 Turn biscotti over and bake for another 5 minutes. Let them cool and then dunk away. These keep quite well and make lovely gifts, wrapped up with fancy paper or a dressed up jar or tin.